The Marine Stewardship Council (MSC) is a global organization that works with a wide variety of fisheries, environmental groups, scientists and consumers to encourage sustainable seafood choices and practices. The Marine Stewardship Council developed and manages a sustainable seafood certification and labeling program based on scientific standards for each fishery and best practice guidelines. Once certified the fishery has the option to attach the MSC blue ecolabel to their seafood products. The blue ecolabel shows that the fishery has been assessed by the Marine Stewardship Council and has met or exceeded their standards. In addition to meeting the MSC standards a certified company must also show that all MSC labeled seafood is separated from non-certified seafood at all stages of the production process. The Marine Stewardship Council also engages in outreach programs to teach consumers and children about sustainable fisheries practices and healthy ocean ecosystems. They work with retailers and seafood companies to promote MSC labeled seafood and help them increase their sustainable seafood product lines. In addition they promote sustainable seafood choices in school lunches and work to help consumers recognize fisheries that are responsibly managed. Currently there are a number of tuna fisheries that are MSC certified and provide MSC canned tuna products to consumers. 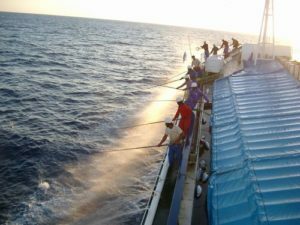 Some MSC certified tuna fisheries include the AAFA Pacific Albacore Tuna Fishery (pole and line) and the Tosakatsuo Suisan pole and line skipjack tuna fishery. There are also numerous other tuna fisheries that are currently in the assessment process and should be certified sometime soon. Looking for MSC certified canned tuna is a good way to ensure that you are getting sustainable canned tuna from a well managed fishery. Properly managed and sustainable fishing practices are essential for healthy oceans and economic stability. As the ocean becomes more and more vulnerable consumer choice when buying canned tuna products become more important. The MSC tuna labeling system for canned tuna products is one step in the right direction. For more information on the Marine Stewardship Council and the MSC standards, please visit their website.